"IF YOU WANT TO GET GOOD AT SOMETHING IN LIFE - HELP OTHERS!" And learning to have good 'Game' with Women, is NO different. 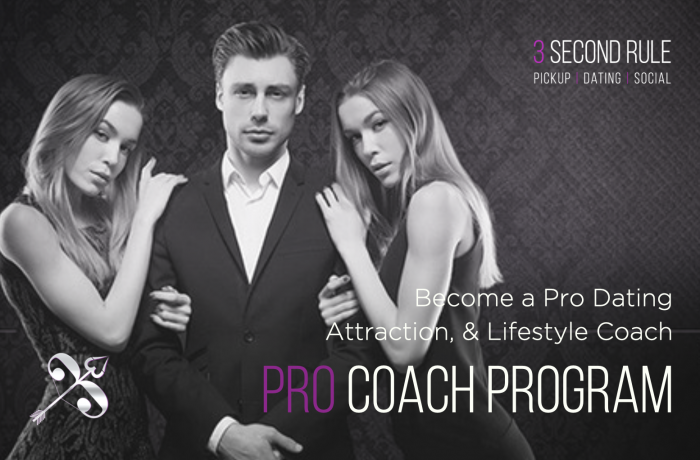 The 3 Second Rule Coach Development Program will give you the most exclusive and current pick up, dating and Social Arts skills and knowledge available in the world. Not just from ONE Dating/Pickup Guru, but 20! Professionally Trained Coaches Globally. We can literally take the "Pain out of your Game" that will massively accelerate your results. No more spending years struggling through countless ebooks, youtube videos, or even Bootcamp PUA Training. Our one of a kind learning experience, with the world’s greatest pickup artists and industry leaders in a comprehensive training program to dramatically improve your skills with Meeting, Approaching, Attracting, Connecting, Closing and Keeping (MAACCK) Beautiful Women. An elite COACH development course that is limited to only 6 men in your country, motivated to learn and take their skills to the ultimate level in #theGame. Complete below and we'll send you the Essentials & Desirable Criteria. 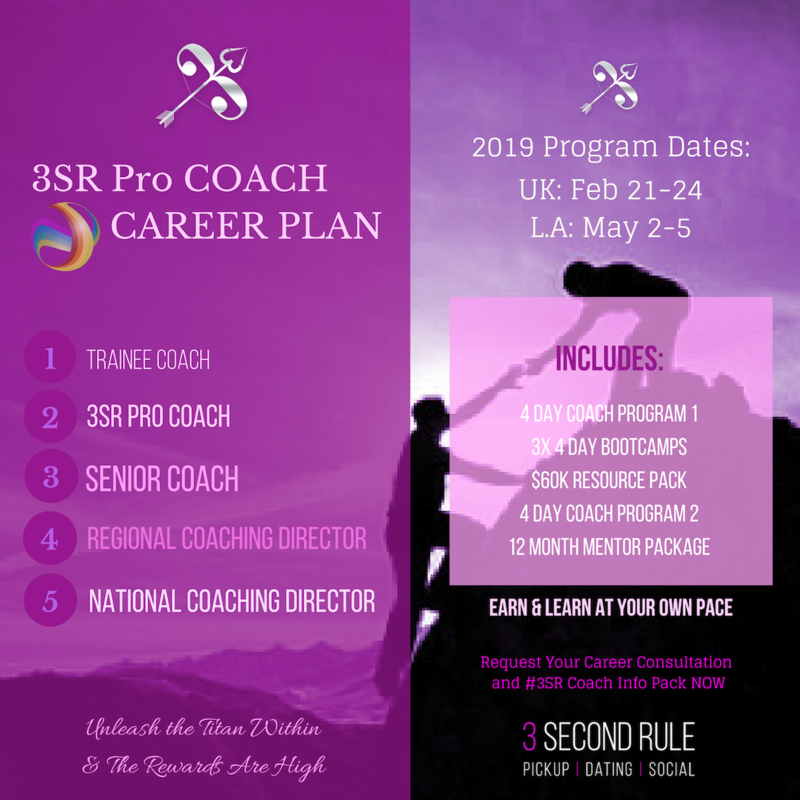 If you qualify, you will then be booked for a free 3SR Coach Career Consultation Call. When you HELP OTHERS you are forced to process information much faster and learn at an accelerated rate. Combine that with knowing that in 3-6 months time YOU too are could be with Mystery & Discovery infield and expected to demo the Basic Pickup Skills - good motivation to get out there and rack up those extra approaches as a PUA! Ever had to explain to a friend how to do a backhand in tennis? or any other Game for that matter - notice just by how you break it down it not only shows you the holes in your own Game but very quickly helps you fill those holes (sticking points) to be better at both Coaching your friend AND your very own effectiveness. Would you just like to help others and make some money in addition to your normal job? Or would you like to still have time to do your Job/Business, do some 1on1s and host regional Bootcamps as a Senior Coach? Why not go Full time and be a National Coaching Director for your Country (State in the USA) and help all other emerging Coaches and ensure quality in our training programs throughout your region, while earning from all products/training sold in your Country/Region. Whatever your Goals and Aspirations we are ALL ABOUT PERSONAL GROWTH! You choose! Have the opportunity to attend all 3SR events Free! Have the opportunity to join the 3SR Development Team – have a say in what products we develop and how we coach others. Get ongoing personal lifestyle advice from a National Coaching Director on how you can improve your whole lifestyle, relationships, personality. It's one thing to learn some Pickup, but becoming a PROFESSIONAL certified Coach and Teacher is a whole other level. And we are the only company to offer a Structured and Professional Accreditation Program to become a fully Certified Coach. With the best Pickup Artist in the World (Mystery) and an Award winning International Speaker, Business Coach and by far the highest Qualified Coach Trainer in the Industry (Discovery), you're in great hands and really do not get any better! 2. Ambassadorship - simply we want a guy passionate, dedicated and someone we can trust to be our guy on the ground in whatever Country, City, State you are in - could you write an article for the local FHM magazine, can you coordinate the clubs for our 1on1 weekends when I fly Mystery in? Can you be a PROfessional and not just a sleazy PUA crawling the streets looking for his next lay? 3. Pickup/Social Artist Skills - can you do the basics well? Can you learn quickly with our support and personal guidance? will you put the effort in and time need to practise the new intermediate-advance material we give you? 4. Coaching Skills - we don't expect them now - we will train you to National Coaching Foundation standards, but we do want to know you are willing to learn and become a great coach, the kind of guy our students will enjoy being both encouraged and corrected by. Will you take our Personality training and work hard to adapt your unique style to connect better with those not like you? Can you listen and hear the meaning and even pain behind a guys personal sticking points and challenges? 5. Coachable - can you yourself be 'Coachable'? sounds simple but the pickup industry is full of egos and everyone who is good thinks they don't need any more training. 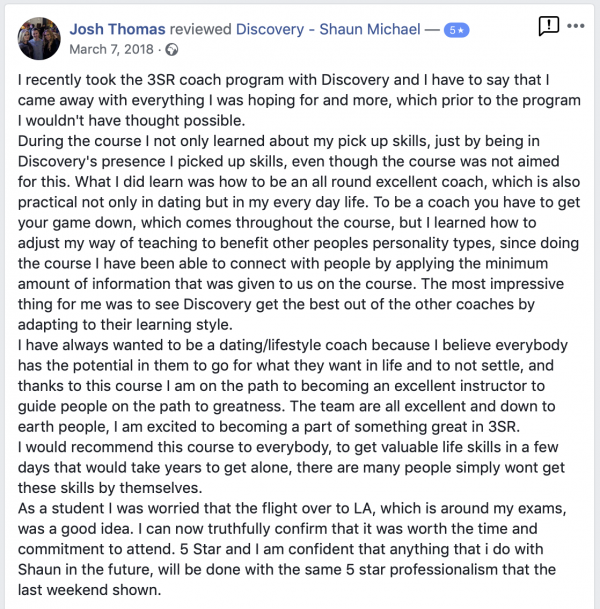 Discovery even insisted MYSTERY attend the Coach program, reminding him it's one thing being able to explain the M3 model in depth, but understanding Jungian Psychology, specifically 'Type Profiling' that allows the Coach to adapt their style, to connect, support and encourage a Student, is a whole other skill set. Do you have the above qualities or can see yourself achieving them? and be trained by the best in the World? "We are Titans, rising above the gravitational pull of the ordinary." you probably won't have the Money. Just say YES and figure out how to make it happen." I took this program a few years back. It changed my game for the best. Probably because to become a coach, your pickup skills had to be evaluated by Mystery or Discovery. That scared the crap out of me enough to get my skill-set handled. Here's what else you have to do to become a coach: log in between 500-1000 approaches (THAT’S what will lock down your skill-set); write 2 or 3 articles for the site, and prove you can help other guys lock down their skill set, too. It’s a challenge that’s made me a better pickup artist. The program focuses more on learning how to coach rather than how to pickup. Three invaluable insights I learned that I still use to this day: First, I got clear on my own personality type. Then I learned how to hone in on the personality types of others. Invaluable skill. You’re able to tailor a coaching style to a client’s preferred learning style. Second, I learned a client has all the answers within him. In other words, I learned to not lecture a client, but how to help a guy discover answers for himself. Third, I learned an ingenious way to give constructive criticism. Rather than just criticize, like most of us do, I learned to find positives (that are specific) first. Then I learned to give the constructive criticism. The initial praise makes it more likely a client will listen to the criticism. But if you end there, the criticism kind of cancels the praise out. So, I learned to follow up the criticism with praise. In other words, end on a positive note. We'd practice this technique on each other during the seminar. Not only has it proved effective in coaching but also in all my relationships. The other great thing about this program is the environment you enter into. I've heard this Zen saying before: "your environment is always stronger than you are." So true. Surround yourself with the best, you become the best. By becoming a coach with this program, you enter into Mystery's circle. A damn good environment, if you ask me. Oh, yes. And the possibility of an extra passive income doesn't hurt either. There's a price tag on this program. And I'm not gonna lie to you, it's a challenge. But that's the real reward. It can take your game (and life) to the next level. Got to say personally, there is NOTHING in the whole Dating, Pickup and Seduction industry that comes close to this level of professional 'train the trainer' program and the sheer value in circa 16 days live training guys get. And remember... "if You want to get good at anything in life, teach someone else."